Hundreds of houses in 10 villages located in the vicinity of the Dappar Ammunition Depot are likely to fall under the proposed ‘no construction zone’ that the Ministry of Defence has decided to declare around the depot. Mozahir Hassan is not as much a victim of fate as he is of official apathy. As if the trauma of rearing three challenged children — two mentally challenged and one physically disabled — was not enough, the hapless father has been suffering for many years at the hands of a system that just doesn’t care. Mentally-challenged Sarfaraz looks at the camera as parents Mozahir Hassan and Noorjehan (extreme left) watch. Also seen are Hassan’s disabled daughters Nagma and Rubina. The Municipal Corporation is to resume the sites of habitual offenders in cases pertaining to encroachment of the commercial sites in various markets of the city. The MC is gathering documentary evidence against the offenders, both documentary and photographic, to initiate administrative proceedings at the earliest. The city went hi-tech today as the Department of Information Technology launched its online payment of power and water bills through credit cards over the Internet. The woes of Bar Council of Punjab and Haryana Chairman C.M. Munjal refuse to end. The ongoing proceedings initiated against him by the Punjab and Haryana High Court in the matter his informing the police that an accused in a criminal case had been granted oral bail by the High Court though no such thing happened today took yet another twist when the court-appointed amicus curiae submitted documents to buttress his claim that this was not the first such incident for Mr Munjal. A highly decomposed body of a Bihari labourer was found today under mysterious circumstances inside his locked rented room in Hallo Majra village. From the appearance of the body it was suspected that the person was murdered a week back. From a star psephologist to a social worker, the transition might sound as different as chalk from cheese. However, for Yogendra Yadav, a popular face on television during elections, the transition happened easily, following the disastrous performance of political scientists in the last Lok Sabha elections. Mr Balwinder Singh Gill, Ludhiana-born Councillor of the Warwick District Council, UK, is one of the few Indians who, having overcome racial inequality in foreign nations, went a step ahead and became a representative of the local population. Hunger for political power among Dalit leaders has crippled Dalit movements in the country, says Mr V.T. Rajshekar, a famed Bangalore-based Dalit protagonist. Talking to The Tribune here today Mr Rajshekar said that most of the Dalit leaders, who initiated movements for the emancipation of Dalits from exploitation persisting for long, had been swallowed by the mainstream political parties. 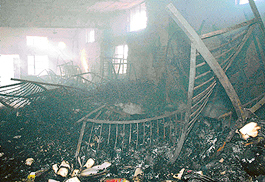 Goods worth lakhs were destroyed in a fire that broke out at a pharmaceutical manufacturing unit, Instant Remedies Pvt Ltd, located along the Kalka-Ambala highway at Gholumajra village today. A local non-governmental organisation (NGO), Burning Brain Society (BBS), has criticised the Punjab Governor and UT Administrator, Gen S.F. Rodrigues (retd), for participating in the Red & White Bravery Award ceremony yesterday. A police team today recorded statements of the daughter of District Congress General Secretary Hemant Kinger and some of his employees. Members of the Allotment Sangharsh Committee met at the Phase 3B1 Rose Garden yesterday in protest against the delay in the allotment of plots in Sectors 76 to 80 in Mohali. THE Id-ul-Azha or Id-ul-Zuha, which falls on Friday, like all festivals, has a philosophy behind it and the chief value implied in it is that of sacrifice. Self-preservation is the first law of nature; its opposite, self-sacrifice, is the virtue that believers are expected to practice in their lives. 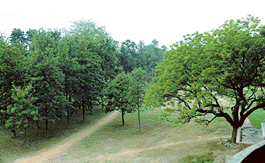 THE lush green environs of the Panjab University campus make it one of the greenest campuses in the country. Trees of all shapes and sizes can be seen here. But very few know that exotic trees have the edge over native trees on the campus. The Deputy Director, Urban Local Bodies, Ludhiana, today inspected the vermiculture project of the local municipal council at the Phase X Silvi Park here today. The police seems to have made little headway in the sensational theft at Sector 12- A, where cash, foreign currency and gold and diamond jewellery amounting to lakhs of rupees was stolen. 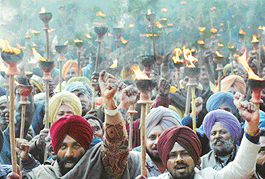 A torchlight procession was held today by employees of the Municipal Corporation and the Union Territory Administration. Members of the Coordination Committee of government and MC employees and workers of UT Chandigarh, take part in a torchlight procession on Tuesday. The Theatre Arts, Chandigarh, staged its 15th consecutive show of the play ‘Mitti ka Aadmi’ at the NAC, Market Complex, Mani Majra, near the Housing Board chowk on Monday to raise funds for the tsunami victims. The artists of the Theatre Arts enthralled the market members and general public with their performance. Students and staff of Mount View Public School have collected Rs 33,500 for the Prime Minister's National Relief Fund for the rehabilitation of tsunami victims. Sunaina, whose two sons were allegedly murdered by her husband on Saturday, was today given Rs 5,000 and a quilt by a Sector 17 shopkeeper. Harwinder Singh of Sector 17 read about the tragedy in the Chandigarh Tribune and approached the police offering to help her. The road safety cell of the Chandigarh Traffic Police, housed in Children Traffic Park in Sector 23, has been provided a free telephone connection by Connect. The police today arrested Kulbhushan Singla, a resident of Sector 16, Panchkula, for allegedly duping a private financing company of Rs 1.25 lakh by submitting forged documents to avail loan for a truck. The Union Bank of India (UBI), Sector 35, filed a fresh complaint against Bharat Bhushan Aggarwal, a resident of Sector 28-A, against whom the Economic Offence Wing of the Chandigarh police is conducting an inquiry into alleged frauds committed by him with this bank. The earlier complaint was made in October last year. A team of the Bureau of Indian Standards (BIS) has raided the premises of Penguin Foods and Beverages Private Limited at Nabipur village in Fatehgarh Sahib district. Three incidents of thefts were reported to the police while a case has been registered of attempted burglary in the city in the past 24 hours, the local police said here today. The Chief Judicial Magistrate, Panchkula, Mr Gulab Singh today remanded Lakhwinder Singh and Ashwani Sethi to police custody till January 27. The police claim that the two are members of a car stealing gang. To meet requirements of the strategic sector in a rapidly changing, technology-intensive environment, the Semiconductor Complex Limited (SCL) has initiated a project to develop night vision devices incorporating revolutionary technology. Chandigarh’s expected leap into the select band of Information Technology destinations in the country is just a few weeks away. Swank glass-faced buildings, built by DLF, are ready for IT companies to move in. Chandigarh Engineering College, Landran, Mohali, today organised a lecture on “Leadership in Twenty-first Century” as part of the Knowledge Reservoir Lecture series. To counsel students appearing in the CBSE board examination beginning in March, the Central Board of Secondary Education has appointed Ms Madhu Bahl, Principal of KB DAV School, Sector 7, as the nodal officer for the board- run tele-counselling facility. 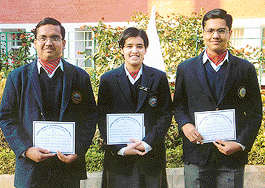 Nitish Goel, Kirti Puri and Sameer Madan, students of Bharatiya Vidya Bhavan, Sector 27, who won a bronze medal in the CBSE Intel Science Quiz held in New Delhi. 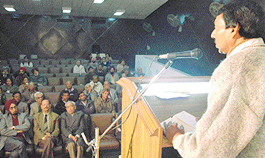 A two-day Northern Regional Workshop under the aegis of Central Advisory Board of Education (CABE) will be held on January 20 and 21 at Panjab University. The workshop will be chaired by Mr Kanti Biswas, Education Minister, Government of West Bengal. In addition, three more Ministers of Education of different states, besides a large number of Vice-Chancellors and senior academicians of the country will participate. An NGO, Sanjivani, has resolved to create awareness among rural students about professional courses and higher education. A section of the contractual faculty of Punjab Engineering College has alleged that while they were being asked to mark their attendance twice a day, there were others who were required to mark it just once. Ravinder Chawla, who was arrested by the Ropar police in the illegal exchange case, was today sent to 14 days of judicial remand by a Kharar court. The melody, rhythm and harmony coalesced to spell a magical brilliance in a musical concert as the quartet of accomplished French musicians ensemble ‘Matmatah’ enchanted the intrusive audience, mainly in the bloom of youth, at the Panjab University Law Auditorium today. 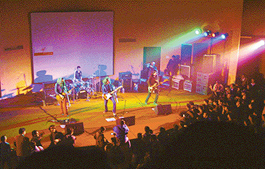 French rock band “Matmatah” performs at the Law Auditorium of Panjab University in Chandigarh on Tuesday. Six feet three inches tall Karoline of Germany knows very little Hindi. Many times it becomes difficult for her to explain her points. But she is more conversant with the ancient Indian curative system of yoga than many yoga practitioners around. ‘Aisa koi funkar-e-mukqammal nahin aya, Naghmo ka barsta badal nahin aya, Sangeet ke mahir to bahut aye hain , Lekin duniyan mein doosra Saigal nahin aya.’ This couplet by maestro Naushad is veritably the befitting tribute to the golden voice of legendary K.L. Saigal, which has established an immortal mystical bond between himself and his inquisitive admirers. Illegal immigration was at the heart of Kewal Dhaliwal’s play presented on the second day of the ongoing drama festival at Tagore Theatre. A juxtaposition of four short stories by eminent writers from the region, the production successfully brought alive the trauma that follows voluntary dislocation from places of origin. As many as 14 slum colonies around the town have been identified by doctors of the local Civil Hospital for the immunisation programme. The Chandigarh Senior Rowing Championship for men and women will be held at the Lake Club on January 21. Sector 19 Coaching Centre, will take on Sector 42 Coaching Centre, ‘A’ team in the tomorrow’s final of the women section of the Chandigarh Senior Handball Championship being played here at the DAV Senior Secondary School grounds, Sector 8. The Municipal Council has requested the Director, Local Government, Punjab, to give administrative and technical approval to the civic body to sink a tubewell in the Phase VIII Industrial Area here at its own level.